"The artist must train not only his eye but also his soul, so that it can weigh colors in its own scale and thus become a determinant in artistic creation." One of the two pioneering movements of German Expressionism, Der Blaue Reiter began in Munich as an abstract counterpart to Die Brücke's distorted figurative style. While both confronted feelings of alienation within an increasingly modernizing world, Der Blaue Reiter sought to transcend the mundane by pursuing the spiritual value of art. Wassily Kandinsky and Franz Marc were the theoretical centers of the group, which included a number of Russian immigrants and native Germans. This internationalism led the group to mount several traveling exhibitions during their brief tenure, making them an indispensable force in the promotion of early avant-garde painting. Though Der Blaue Reiter had no official manifesto, Kandinsky's treatise Concerning the Spiritual in Art (1910) laid out several of its guiding principles. Concerning the Spiritual crystallized the group's pursuit of non-objective or abstract painting and was widely read in avant-garde artistic circles across Europe and beyond. 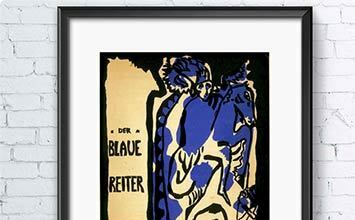 Der Blaue Reiter painting was structured around an idea that color and form carried concrete spiritual values. Thus, the move into abstraction resulted partly from radically separating form and color into discrete elements within a painting or applying non-naturalistic color to recognizable objects. The name "Der Blaue Reiter" referred to Kandinsky and Marc's belief that blue was the most spiritual color and that the rider symbolized the ability to move beyond. In searching for a language that would express their unique approach to abstract visual form, the artists of Der Blaue Reiter drew parallels between painting and music. Often naming their works Compositions, Improvisations, and Études (among other things), they explored music as the abstract art par excellence, lacking as it does a tangible or figurative manifestation. This also led them to explore notions of synesthesia, the crossing or "union" of the senses in perceiving color, sound, and other stimuli. Beside its own groundbreaking artists, Der Blaue Reiter's traveling exhibitions featured the leading proponents of Fauvism, Cubism, and the Russian avant-garde, creating a vital central European forum for the development and proliferation of modern art. In January of 1909, Wassily Kandinsky proposed forming a new group of like-minded artists in opposition to traditional exhibition venues, the Neue Künstlervereinigung München (Munich New Artists' Association), a secession movement that contained several future members of Der Blaue Reiter. The founders included Kandinsky's Russian compatriots Alexej von Jawlensky and Marianne von Werefkin, as well as the Germans Gabriele Munter, Alexander Kanoldt, and the German-American Adolf Erbsloh. Aside from their desire to "secede" from the mainstream art institution and their dedication to modern art, these artists shared an expressionistic visual style culled partly from the example of Fauvism and partly from turn-of-the-century Symbolism, as exemplified by artists like Edvard Munch and Gustav Klimt. A founding member of the Neue Künstvereinigung Munchen (NKvM), Marianne von Werefkin later joined Der Blaue Reiter. Her Self-Portrait of 1910 exemplifies the experimentation of the former group and the semi-abstract manipulation of form and color that would develop in the latter. Her loose, dynamic brushwork shows the early influence of Vincent van Gogh on the NKvM artists and her use of arbitrary color is reminiscent of their study of Paul Gauguin and Edvard Munch. Indeed, the haunting tone she culled from her choice of clashing, vibrant hues, the flattened space of her composition, and the figure's confrontational red-eyed gaze carry all the emotional and symbolic weight of Munch's The Scream, while demonstrating several elements that prefigured the expressionistic painting of Der Blaue Reiter. The name Der Blaue Reiter is widely considered to derive from a 1903 Symbolist canvas by Kandinsky. However, when Kandinsky painted that early canvas, perhaps indebted more to Gustav Klimt or Les Nabis, he had not yet developed the theory of color symbolism he would publish in Concerning the Spiritual in Art. His woodcut cover for Der Blaue Reiter's almanac (published in 1912) is thus more in keeping with the movement's aesthetic and ideals. First, the choice of the bold, flat, "primitive" woodcut format reveals Der Blaue Reiter's focus on direct representation and interest in Primitivism. The choice of the semi-abstract "blue rider," with the color blue symbolizing intense spirituality and the rider symbolizing transcendent mobility, makes Kandinsky's print into a visual manifesto of his key concepts. Beyond his visual offerings, Kandinsky was central to the group as a theorist, and behind this cover he continued that role by publishing two essays and an experimental theater piece. Before and during his years in Der Blaue Reiter, Marc developed a color theory that ran parallel and occasionally overlapped with Kandinsky's. In a 1910 letter to August Macke, he wrote: "Blue is the male principle, astringent and spiritual. Yellow is the female principle, gentle, gay, and spiritual. Red is matter, brutal and heavy and always the color to be opposed and overcome by the other two." In Yellow Cow, then, Marc portrayed his emblem of femininity, resounding in its joyous spirituality, barely able to be suppressed or even balanced out by the opposing colors that surround it. Marc was predominantly a painter of animals, and pantheistic "back-to-nature" groups, popular in turn-of-the-century Germany, influenced his idea of spiritualism. Taking a stance closely related to Primitivism, Marc considered animals to be closer to an innate, natural state of spirituality that mankind lost with civilization. Widely considered Kandinsky's prewar masterpiece, Composition VII was, at the least, the mostly highly worked canvas he achieved with Der Blaue Reiter. His largest painting (at 6 by 10 feet), it is a dynamic cacophony of colors and forms with very little in the way of recognizable imagery. Despite the heightened abstraction he achieved, scholars have studied Composition VII in relation to Kandinsky's earlier Compositions and his studies for the painting to uncover apocalyptic motifs borrowed from the Bible's Book of Revelations, such as a walled city on a mountain, the volleys of cannons and fanfares of trumpets, a cleansing flood, and the Last Judgment. Kandinsky's push for abstraction was predicated upon a belief that mankind lived in the end of times and required spiritual rebirth. The widespread destruction of World War I (1914-18) struck many artists and intellectuals as a literal apocalypse, and Kandinsky would later respond by removing all recognizable imagery - especially representations of violent conflict - from his painting. Though Der Blaue Reiter developed its own lineage of Symbolist and Post-Impressionist painters, it belonged to an international avant-garde from which it adopted a range of modern styles. Marc achieved perhaps the most dynamic hard-edged style due to his adoption of Cubist faceting and the force lines of Futurism. Painted with a violence absent from his other major works, The Fate of the Animals has been read as a premonition of the war to come, with a conflagration destroying the animals' forest home. The upright pose of the central blue deer indicates - in keeping with Marc's color theory - the possibility of transcendence. The cross created by the diagonal background suggests sacrifice and rebirth. Many intellectuals, Marc included, saw the forthcoming war as a chance for spiritual renewal. Military service would change Marc's views on this drastically, and he ultimately died in battle. The brown-tinted right third of the painting was restored by Marc's friend Paul Klee after having been damaged in a warehouse fire in 1916. Klee's groundbreaking explorations in the field of color theory began with his time in Der Blaue Reiter. Before his affiliation with the group, he was a musician and experimental graphic artist, but he had not developed his talents as a colorist. Inspired by Kandinsky's writings, he began to move beyond his early black and white works toward an intense study of color and abstraction, soon becoming a central member of the group. In 1914 he traveled with Macke and the Swiss painter Louis Moilliet to Tunisia, a trip that revolutionized his growth as an artist. In Tunisia, Klee wrote in his diary of "discovering" color: "Color possesses me. It will always possess me. That is the meaning of this happy hour: color and I are one. I am a painter." Painted after his return to Munich, Germany, In the Style of Kairouan (named after the Tunisian city) is considered Klee's first wholly abstract work. It exchanges recognizable imagery for a balanced geometric composition of circles, rectangles, and irregular polygons delicately colored in a variety of mixed hues. Painted after the outbreak of WWI and the subsequent dissolution of Der Blaue Reiter, Macke's Farewell reflects the darker mood that overtook many European modern artists. His mixed, subdued palette contrasts with the brightly primary colored canvases common to his prewar Blaue Reiter colleagues, and his looming background figures are visually more akin to the alienated men and women in Ernst Ludwig Kirchner's expressionistic street scenes or to Munch's The Scream. These visual cues have been taken to represent his feelings of wartime fear and anxiety. His simplified, featureless figures follow from Der Blaue Reiter's approach to abstraction, though gone is the feeling of spiritual redemption. Sadly, Farewell was the last painting that Macke completed before his death at the front in September 1914. Expressionism - specifically that of Der Blaue Reiter - experienced a renewal and afterlife at the Bauhaus. Though the Bauhaus would pursue different goals (and eventually, a more streamlined design aesthetic), Feininger was among several Der Blaue Reiter members who wound up teaching at the groundbreaking institution. His Cathedral woodcut for the cover of the Bauhaus program figuratively marked the institution with a Blaue Reiter "stamp." His choice of a Gothic cathedral - a centuries-old German symbol related to Christian transcendence - is complemented by the modern elements of Cubism, Futurism, Expressionism, and Russian Rayonism that he used to create a vertical, semi-abstract composition. The Bauhaus would use the cathedral as a symbol for their goal of unifying the fine and applied arts under one roof; Feininger cleverly brought this goal into line with the concepts of spirituality and abstraction first put forth in Germany by his Der Blaue Reiter group nearly a decade prior.